Click in the lower right hand corner for the coupon. You may have to do a quick download of 'brick' if you've never printed coupons online before, but otherwise, it's as simple as that. 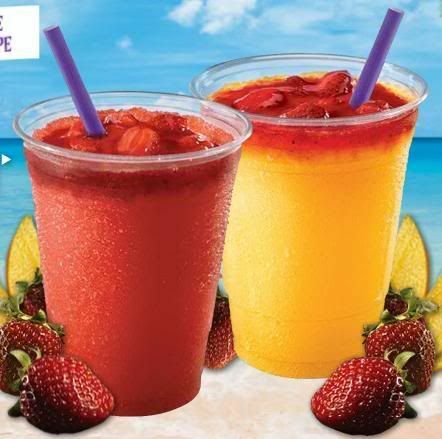 And if they're not your cup of tea....er....fruit slushy.....then at least go over there for the 5 seconds worth of scrolling over the cups where they describe the drinks to you. They emphasize in bold letters that they're topped with real strawberries, and even animate the toppings when you mouse over, hehe. I love the mango strawberry fruitasia freeze! Unbelievable! Awesome! I'm hooked for good!